Population Ranked 8th in the U.S.
Michigan is a Midwestern state of the United States of America, located in the east north central portion of the country. It was named after Lake Michigan, whose name was a French adaptation of the Ojibwe term mishigami, meaning "large water" or "large lake." Bounded by four of the five Great Lakes, plus Lake Saint Clair, Michigan has the longest freshwater shoreline in the world, and the second longest total shoreline in the United States, after Alaska (excluding island shorelines), and in 2005 had more registered recreational boats than any state except California and Florida. A person in Michigan is never more than 85 miles (137 km) from open Great Lakes water and is never more than 6 miles (10 km) from a natural water source. Michigan is the only bi-peninsular state. The Lower Peninsula of Michigan, to which the name Michigan was originally applied, is sometimes dubbed "the mitten," owing to its shape. When asked where in Michigan one comes from, a resident of the Lower Peninsula often points to the corresponding part of his or her hand. The Upper Peninsula (U.P.) is separated from the Lower Peninsula by the Straits of Mackinac, a five-mile channel that joins Lake Huron to Lake Michigan. The Upper Peninsula (whose residents are often called "Yoopers") is economically important for tourism and its natural resources. The Upper and Lower Peninsulas are connected by the five-mile-long Mackinac Bridge, which is the third longest suspension bridge between anchorages in the world. The Great Lakes that border Michigan are Lake Erie, Lake Huron, Lake Michigan and Lake Superior. Michigan also borders Lake Saint Clair, which is between Lake Erie and Lake Huron. Michigan consists of two peninsulas that lie between 82°30' to about 90º30' west longitude, and are separated by the Straits of Mackinac. The state is bounded on the south by the states of Ohio and Indiana, sharing both land and water boundaries with both. 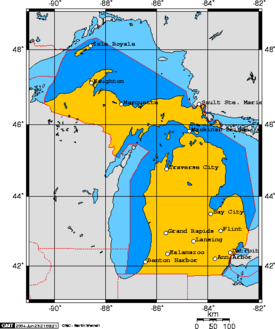 Michigan's western boundaries are almost entirely water boundaries, from south to north, with Illinois and Wisconsin in Lake Michigan; there is a land boundary with Wisconsin in the Upper Peninsula, that is principally demarcated by the Menominee and Montreal rivers; then water boundaries again, in Lake Superior, with Wisconsin and Minnesota to the west, capped by the Canadian province of Ontario to the north and east. The northern boundary runs through Lake Superior, from the western boundary with Minnesota to a point north of and around Isle Royale, (which is Michigan's only National Park). The boundary then runs southeastward through the lake in a reasonably straight line to the Sault Ste. Marie area. Windsor, Ontario, once the south bank of Detroit, Upper Canada, has the distinction of being the only part of Canada which lies to the due south of a part of the lower 48 contiguous United States. 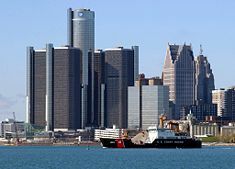 Detroit is the only major city in the United States from which one can travel south to cross the border into Canada. In Southeastern Michigan there is a water boundary with Canada along the entire lengths of the St. Clair River, Lake St. Clair (including the First Nation reserve of Walpole Island), and the Detroit River. The south-eastern boundary ends in the western end of Lake Erie with a three-way convergence of Michigan, Ohio, and Ontario. Michigan encompasses 58,110 square miles (150,504 sq km) of land, 38,575 square miles (99,909 sq km) of Great Lakes waters and 1,305 square miles (3,380 sq km) of inland waters. Only the state of Alaska has more territorial water. At a total of 97,990 square miles (253,793 sq km), Michigan is the largest state east of the Mississippi River (inclusive of its territorial waters). It is the 10th largest state in the Union. The US Census Bureau reports 56,803.82 sq mi of land and 96,716.11 sq mi total, making it the 11th largest. The heavily forested Upper Peninsula is relatively mountainous. The Porcupine Mountains, which are the oldest mountains in North America, rise to an altitude of almost 2,000 feet above sea level and form the watershed between the streams flowing into Lake Superior and Lake Michigan. The terrain on either side of this range is rugged. The state's highest point, in the Huron Mountains northwest of Marquette, is Mount Arvon at 1,979 feet (603 m). 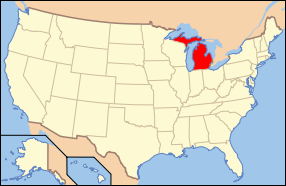 The peninsula is as large as Connecticut, Delaware, Massachusetts, and Rhode Island combined, but has fewer than 330,000 inhabitants, who are sometimes called "Yoopers" (from "U.P. 'ers") and whose speech (the "Yooper dialect") has been heavily influenced by the large number of Scandinavian and Canadian immigrants who settled the area during the mining boom of the late 1800s. The Lower Peninsula, shaped like a mitten, is 277 miles (446 km) long from north to south and 195 miles (314 km) from east to west and occupies nearly two-thirds of the state's land area. The surface of the peninsula is generally level, broken by conical hills and glacial moraines usually not more than a few hundred feet tall. It is divided by a low water divide running north and south. The larger portion of the state is on the west of this and gradually slopes toward Lake Michigan. The highest point in the Lower Peninsula is not definitely established but is either Briar Hill at 1,705 feet (520 m), or one of several points nearby in the vicinity of Cadillac. The lowest point is the surface of Lake Erie at 571 feet (174 m). The geographic orientation of Michigan's peninsulas make for a long distance between the ends of the state. The town of Ironwood, in the far western Upper Peninsula, lies 630 highway miles (1,015 km) from the Toledo, Ohio suburb of Lambertville in the Lower Peninsula's southeastern corner. The geographic isolation of the Upper Peninsula from Michigan's political and population centers makes it culturally and economically distinct, and has led to occasional calls for secession from Michigan and admission as a new state called with a proposed name of "Superior." There are numerous lakes and marshes in both peninsulas. Keweenaw, Whitefish, and the Big and Little Bays De Noc are the principal indentations on the Upper Peninsula, while the Grand and Little Traverse, Thunder, and Saginaw bays indent the Lower Peninsula. After Alaska, Michigan has the longest shoreline of any state—3,288 miles (5,326 km). An additional 1,056 miles (1,699 km) can be added if islands are included. This roughly equals the length of the Atlantic Coast from Maine to Florida. The state has many large islands, the principal ones being the Manitou, Beaver, and Fox groups in Lake Michigan; Isle Royale and Grande Isle in Lake Superior; Marquette, Bois Blanc, and Mackinac Islands in Lake Huron; and Neebish, Sugar, and Drummond Islands in St. Mary's River. The state's rivers are small, short and shallow, and few are navigable. The principal ones include the Au Sable, Thunder Bay, Cheboygan, and Saginaw, all of which flow into Lake Huron; the Ontonagon, and Tahquamenon, which flow into Lake Superior; and the St. Joseph, Kalamazoo, Grand, and Escanaba, which flow into Lake Michigan. No point in Michigan is more than 6 miles (10 km) from an inland lake or more than 85 miles (137 km) from one of the Great Lakes. The state is home to one national park: Isle Royale National Park. Other national protected areas in the state include: Keweenaw National Historical Park, Pictured Rocks National Lakeshore, Sleeping Bear Dunes National Lakeshore, and Father Marquette National Memorial. There are four National Forests: the Manistee, the Hiawatha, the Ottawa, and the Huron National Forest. The North Country National Scenic Trail also passes through Michigan. 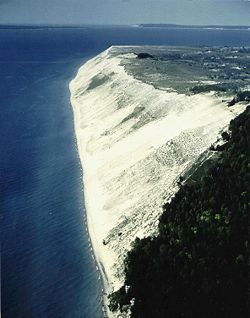 Michigan also has the largest state park system and state forest system in the US. Michigan has a generally humid continental climate although there are two distinct regions. The southern and central parts of the Lower Peninsula (south of Saginaw Bay and from the Grand Rapids area southward) has a warmer climate with hot, humid summers and cold, but shorter winters. The northern part of Lower Peninsula and the entire Upper Peninsula has a more severe climate, with warm, humid but shorter summers and long, cold to very cold winters. Some parts of the state average high temperatures below freezing from December through February, and into early March in the far northern parts. During the late fall through the middle of February the state is frequently subjected to heavy lake effect snow. Michigan receives an average of 30-40 inches (750-1000 mm) of precipitation annually. Typically, December through March is slightly drier, while July through September is slightly wetter than the rest of the year, although this difference is not extreme. The entire state averages around 30 days of thunderstorm activity per year; these can be severe, especially farther south in the state. Michigan averages 17 tornadoes a year; these are much more common in the extreme southern part of the state. Farther north, in the Upper Peninsula, tornadoes are rare, but have occurred. The geological formation of the state is greatly varied. Primary boulders are found over the entire surface of the Upper Peninsula (being principally of primitive origin), while Secondary deposits cover the entire Lower Peninsula. The Upper Peninsula exhibits Lower Silurian sandstones, limestones, copper and iron bearing rocks, corresponding to the Huronian system of Canada. The central portion of the Lower Peninsula contains coal measures and rocks of the Permo-Carboniferous period. Devonian and sub-Carboniferous deposits are scattered over the entire state. The soil is of a varied composition and can be very fertile, especially in the south. However, the Upper Peninsula is mostly rocky and mountainous, and the soil is unsuitable for agriculture. The climate is tempered by the proximity of the lakes and is much milder than in other locales with the same latitude. The principal forest trees include basswood, maple, elm, sassafras, butternut, walnut, poplar, hickory, oak, willow, pine, birch, beech, hemlock, witchhazel, tamarack, cedar, locust, dogwood, and ash. 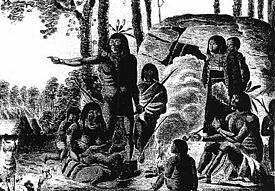 French voyageurs explored and settled in Michigan in the seventeenth century. The first Europeans to reach what later became Michigan were Étienne Brûlé's expedition in 1622. The first European settlement was made in 1641 on the site where Father (or Père, in French) Jacques Marquette established Sault Sainte-Marie in 1668. Saint-Ignace was founded in 1671, and Marquette in 1675. Together with Sault Sainte-Marie, they are the three oldest cities in Michigan. "The Soo" (Sault Ste. Marie) has the distinction of being the oldest city in both Michigan and Ontario. It was split into two cities in 1818, a year after the U.S.-Canada boundary in the Great Lakes was finally established by the US-Great Britain Boundary Settlement. In 1679, Lord La Salle of France directed the construction of the Griffin, the first European sailing vessel on the upper Great Lakes. That same year, La Salle built Fort Miami at present-day St. Joseph. In 1701, French explorer and army officer Antoine de la Mothe Cadillac founded Le Fort Ponchartrain du Détroit or “Fort Ponchartrain on-the-Strait” on the Detroit River, between Lakes St. Clair and Erie. Cadillac had convinced King Louis XIV's chief minister, Louis Phélypeaux, Comte de Pontchartrain, that a permanent community there would strengthen French control over the upper Great Lakes and repel British aspirations. The hundred soldiers and workers who accompanied Cadillac built a fort enclosing one arpent (about .85 acre, the equivalent of just under 200 feet on a side) and named it Fort Pontchartrain. Cadillac's wife, Marie Thérèse, soon moved to Detroit, becoming one of the first European women to settle in the Michigan wilderness. The town quickly became a major fur-trading and shipping post. The “Église de Saint-Anne,” or Church of Saint Ann, was founded the same year, and while the original building does not survive, it remains an active congregation. The French also strengthened Fort Michilimackinac at the Straits of Mackinac to better control their lucrative fur-trading empire. 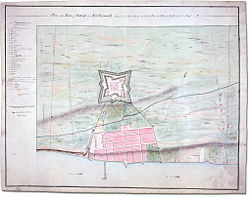 By the mid-eighteenth century, the French also occupied forts at present-day Niles and Sault Ste. Marie. However, most of the rest of the region remained unsettled by Europeans. From 1660 to the end of French rule, Michigan (along with Wisconsin, eastern Minnesota, Illinois, Indiana, Ohio, Kentucky, Tennessee, Mississippi, Alabama, two-thirds of Georgia, and small parts of West Virginia, Pennsylvania, New York, Vermont, and Maine) was part of the Royal Province of New France, administered from the capital city of Québec. In 1759, following the Battle of the Plains of Abraham, in the French and Indian War (1754–1763), Québec City fell to British forces. Under the 1763 Treaty of Paris, Michigan and the rest of New France passed to Great Britain. Detroit was an important British supply center during the American Revolutionary War, but most of the inhabitants were either Aboriginal people or French Canadians. Because of imprecise cartography and unclear language defining the boundaries in the 1763 Treaty of Paris, the British retained control of Detroit and Michigan. When Quebec was split into Lower and Upper Canada in 1790, Michigan was part of Kent County, Upper Canada, and held its first democratic elections in August 1792, to send delegates to the new provincial parliament at Newark, (Now Niagara-on-the-Lake). Under terms negotiated in the 1794 Jay Treaty, Britain withdrew from Detroit and Michilimackinac in 1796. However, questions remained over the boundary for many years and the United States did not have uncontested control of the Upper Peninsula and Drummond Island until 1818 and 1847, respectively. During the War of 1812, Michigan Territory (effectively consisting of Detroit and the surrounding area) was captured by the British and nominally returned to Upper Canada until the Treaty of Ghent, which implemented the policy of "Status Quo Ante Bellum" or "Just as Things Were Before the War." That meant Michigan stayed American, and the agreement to establish a boundary commission also remained valid. The Rush-Bagot treaty of 1817 effectively disarmed the border between the US and Canada; following the Treaty of Ghent, the Boundary Settlement of 1818, signed by Gallatin and Rush, fixed the border at the 49th parallel. Subsequent to that, control of the Upper Peninsula and the islands in the St. Clair River delta was transferred from Ontario to Michigan in 1818, and Drummond Island (to which the British had moved their Michilimackinac army base) was transferred in 1847. The population grew slowly until the opening of the Erie Canal in 1825, which brought a large influx of settlers to the region. By the 1830s, Michigan had some 80,000 residents, surpassing the requirement of 60,000 set by the Northwest Ordinance as a criterion for statehood. A state government was formed in 1836, although Congressional recognition of the state languished because of a boundary dispute with Ohio, with both sides claiming a 468 square mile (1,210 km²) strip of land that included the newly incorporated city of Toledo on Lake Erie and an area to the west then known as the "Great Black Swamp." The dispute came to be called the Toledo War, with Michigan and Ohio militia maneuvering in the area but never actively engaging. 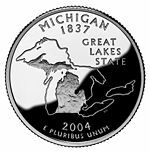 Ultimately, Congress awarded the "Toledo Strip" to Ohio, and Michigan, having received the western part of the Upper Peninsula as a concession, formally entered the Union on January 26, 1837. Thought to be wasteland at the time, the Upper Peninsula was soon discovered to be a rich and important source of lumber, iron, and copper, soon to become the state's most sought-after natural resources. Geologist Douglass Houghton and land surveyor William Austin Burt were among the first to document and discover many of these resources, which led to a nation-wide increase of interest in the state. Michigan led the nation in lumber production from 1850s to the 1880s. Michigan was home to a strong anti-slavery movement dating from the early 1830s. An important stop on the Underground Railroad assisting escaped slaves on their way to Canada, one of most well-known women activists in US history, Sojourner Truth, maintained a haven along the route in Battle Creek. The Republican Party was formed in 1854, in Michigan, in direct opposition to the expansion of slavery. The first Republican–dominated legislature passed laws in 1855 prohibiting aiding in the capture of escaped slaves in Michigan. Michigan made a significant contribution to the Union in the American Civil War, sending over 40 regiments of volunteers to the Federal armies. Michigan's economy underwent a massive change at the turn of the twentieth century. 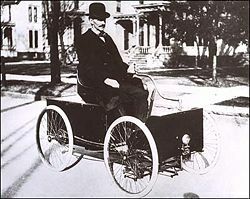 The birth of the automotive industry, with Henry Ford's first plant in the Highland Park neighborhood of Detroit, marked the beginning of a new era in transportation. It was a development that not only transformed Detroit and Michigan, but permanently altered the socio-economic climate of the United States and much of the world. Grand Rapids, the second-largest city in Michigan, was also an early center of automotive manufacturing. Grand Rapids was also known for its thriving furniture industry. 1920s skyscrapers in downtown Detroit. In 1920 Detroit’s WWJ began commercial broadcasting of regular programming, the first such radio station in the United States. In the 1920s some of the country's largest and most ornate skyscrapers were built in the city of Detroit. 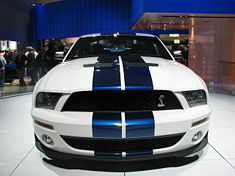 A large part of the strength of the Michigan's boom was the automotive industry. Rocky relations with workers in the early years of the industry led to work actions, starting with the Flint strike of 1936, that eventually solidified the role of labor unions. Securing safe working conditions and good wages, the United Auto Workers union emerged in the 1930s as the representative of line workers with nearly all of the major automakers. Ford Motor Company resisted unionization of its workers until 1941. Housing shortages and racial tension led to outward movement starting after World War II. Detroit boomed through the 1950s, at one point doubling its population in a decade. After the 1950s, with suburban sprawl prevalent across the country, Detroit's population began to decline. The rate increased after further racial strife in the 1960s and high crime rates in the 1970s and 1980s. Government programs such as road-building often enabled the sprawl. Since the 1970s, Michigan's industrial base has eroded as the auto industry began to abandon the state's industrial areas in favor of less expensive labor found overseas and in the southern US. Nevertheless, with more than 10 million residents, Michigan remains a large and influential state, ranking eighth in population among the 50 states. The Detroit metropolitan area in the southeast corner of the state is the largest metropolitan area in Michigan, home to roughly 50 percent of the state's population, and is one of the 10 largest metro areas in the country. Metro Detroit's population is now growing slowly, and Detroit's population is still shrinking overall, despite strong redevelopment efforts in parts of the city, and a significant rise in population in the southwest part of the city. Economic transition and global restructuring, especially in manufacturing, have caused the regional economy to perform worse than the national average for several years. The Grand Rapids/Holland/Muskegon metro area on the west side of the state is the fastest growing metro area in the state presently, with over 1.3 million residents as of 2006. 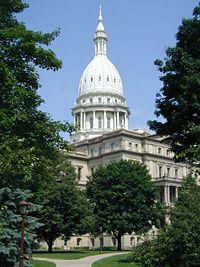 Lansing is the Michigan's capital city and the state's sixth largest city. Once a sleepy settlement of fewer than 20 people, it remained relatively dormant until the winter of 1847 when the state constitution required that the capital be moved from Detroit to a more centralized and safer location in the interior of the state. Many were concerned about Detroit's close proximity to British-controlled Canada, which had captured Detroit in the War of 1812. The United States had recaptured the city in 1813, but these events led to the dire need to have the center of government relocated away from hostile British territory. During the multi-day session to determine a new location for the state capital, many cities, including Ann Arbor, Marshall, Jackson, and Calumet (located in the Upper Peninsula), lobbied hard to win this designation. Unable to publicly reach a consensus due to constant political wrangling, the Michigan House of Representatives privately chose the Township of Lansing out of frustration. When announced, many present openly laughed that such an insignificant settlement was now the capital city of Michigan. Two months later, the governor William L. Greenly signed into law the act of the legislature officially making Lansing Township the state capital. The small village quickly transformed into the seat of state government and was given the name Lansing in April 1848. Michigan's chief executive is the Governor. The legislative branch consists of the bicameral Michigan Legislature, with a House of Representatives and Senate. The Michigan legislature is a full-time legislature. 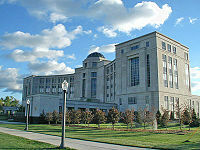 The Supreme Court of Michigan sits with seven justices. The Constitution of Michigan of 1963 provides for voter initiative and referendum (Article II, § 9, defined as "the power to propose laws and to enact and reject laws, called the initiative, and the power to approve or reject laws enacted by the legislature, called the referendum. The power of initiative extends only to laws which the legislature may enact under this constitution"). Michigan was the first state in the Union, as well as the first English-speaking government in the world, to abolish the death penalty, in 1846. David G. Chardavoyne has suggested that the abolitionist movement in Michigan grew as a result of enmity towards the state's neighbor, Canada, which under British rule made public executions a regular practice. Michigan Governor Jennifer Granholm, elected in 2003. The Republican Party dominated Michigan until the Great Depression. In 1912, Michigan was one of the few states to support progressive Republican and third party candidate Theodore Roosevelt for President after he lost the Republican nomination to William Howard Taft. More recently, the state has trended toward the Democratic Party in national elections. Michigan has supported Democrats in the last four presidential elections. In 2004, John Kerry carried the state over George W. Bush, winning Michigan's 17 electoral votes with 51.2 percent of the vote. Democrats have won each of the last three, and nine of the last ten, US Senate elections in Michigan. A member of the Democratic Party, Jennifer Granholm became Michigan's first female governor on January 1, 2003, when she succeeded Governor John Engler. Granholm was re-elected on November 7, 2006, and due to term limits, was sworn in for her second and final term on January 1, 2007. Republican strength is greatest in the western, northern, and rural parts of the state, especially in the Grand Rapids area. Democrats are strongest in the east, especially in Detroit, Ann Arbor, Flint, and Saginaw. Michigan's Department of Natural Resources manages the largest dedicated state forest system in the nation. The forest products industry and recreational users contribute $12 billion and 200,000 associated jobs annually to the state's economy. Michigan has more than 90 native species of trees, more than all of Europe. Hunting is a major component of Michigan's economy. Michigan ranks first in the nation in licensed hunters (over one million) who contribute $2 billion annually to its economy. Over three-quarters of a million hunters participate in white-tailed deer season alone. Many K-12 school districts in rural areas of Michigan cancel school on the opening day of rifle season, because of both safety and attendance concerns. In agriculture, Michigan is a leading grower of fruit, including cherries, blueberries, apples, grapes, and peaches. It produces wines, a large percentage of the US soybean crop, and a multitude of food products. Michigan is also the US's third largest grower of evergreens for Christmas trees. Detroit's downtown viewed from the Detroit River. The Michigan economy leads in information technology, life sciences, and advanced manufacturing. Michigan ranks fourth nationally in high tech employment with 568,000 high tech workers, including 70,000 in the automotive industry. Michigan typically ranks second or third in overall Research & Development (R&D) expenditures in the United States. The state is an important source of engineering job opportunities. The domestic auto industry accounts directly and indirectly for one of every ten jobs in the U.S. Even though Michigan is known as the birthplace of the automobile industry, its diverse economy leads in many other areas. Michigan has a booming biotechnology and life sciences corridor. Michigan's workforce is well-educated and highly skilled, making it attractive to companies. Michigan has a thriving tourist industry, with destinations such as Traverse City, Mackinac Island, Ludington, Muskegon, Saugatuck, the Upper Peninsula, Frankenmuth, Grand Haven, Grand Rapids, and Detroit, drawing vacationers, hunters, fishing and nature enthusiasts from across the United States and Canada. Although it has an urban image to non-visitors, Michigan is actually fifty percent forest land, much of it quite remote. Both the forests and miles of beaches and sand dunes are top attractions. Tourists also flock to many of the museums, particularly those in Metro Detroit, including The Henry Ford and Greenfield Village, the Detroit Institute of Arts and the Arab American National Museum. The Metro Detroit area offers four major casinos, MGM Grand Detroit, Greektown, Motor City, and Casino Windsor. 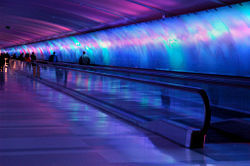 Detroit Metropolitan Airport's colorful Light Tunnel connecting Concourses A and B/C in the McNamara Terminal. Light patterns along the tunnel are choreographed with music. Michigan's infrastructure gives it a competitive edge. The state has 38 deep water ports, and Detroit Metropolitan Airport is one of the nation's most recently expanded and modernized airports with six major runways and large aircraft maintenance facilities capable of servicing and repairing the Boeing 747. Michigan has six border crossings with Ontario, Canada: International Bridge, linking Sault Ste. Marie Michigan with Sault Ste. Marie, Ontario; the Blue Water Bridge, a twin span connecting Port Huron, Michigan with Sarnia, Ontario; the Detroit-Windsor Tunnel; the Ambassador Bridge, crossing to Windsor, Ontario from Detroit; the Canadian Pacific Railway Tunnel; and the Detroit-Windsor Truck Ferry. There are also several small-scale car ferry crossings operating on the St. Clair River. Additionally, the busiest lock system in the world is the Soo Lock, based in Sault Ste. Marie, where the St. Marys River links Lake Superior and Lake Huron. The Detroit-Windsor crossing is the busiest border crossing between the US and Canada. Major bridges include the international Ambassador Bridge and Blue Water Bridge, the beloved Mackinac Bridge, and Sault Ste. Marie International Bridge. Michigan also has the Detroit-Windsor Tunnel crossing into Canada. Michigan has a major international airport, Detroit Metropolitan International Airport, in Wayne County, southwest of Detroit. Two other airports serving the state are Bishop International in Flint, and Coleman A. Young Airport in Detroit. Six other smaller airports, in Grand Rapids, Kalamazoo, Traverse City, Saginaw, and Muskegon and Marquette counties, serve the rest of the state. Michigan is traversed by several hundreds of miles of railroad. Freight rail traffic represents the use of most of the railroads. There is Amtrak passenger rail service in the state, connecting the cities of Port Huron, Detroit, Ann Arbor, East Lansing, Grand Rapids, Jackson,and Kalamazoo to Chicago, Illinois and to Toronto, Ontario via Sarnia. Public education for children was inaugurated in Michigan prior to statehood. In 1809, schools were built and supported by taxes. In 1835, Michigan's first state constitution included a requirement for a Superintendent of Public Instruction at the state government level; this position created the first independent administrator of schools in the country. There are 549 public school districts in Michigan. Michigan is the home of three large public university systems: the University of Michigan, with its main campus in Ann Arbor, and the Michigan State University system, with its main campus in East Lansing, and Wayne State University, with its main campus in Detroit. There are also ten smaller public universities in Michigan, and 47 private colleges, universities and business schools. Michigan's state universities are immune from control by the legislature, many aspects of the executive branch, and cities in which they are located; but they are not immune from the authority of the courts. Some degree of political control is exercised as the legislature approves appropriations for the schools. Furthermore, the governor appoints the board of trustees of most state universities with the advice and consent of the state Senate. Only the trustees of the University of Michigan, Michigan State University, and Wayne State University are chosen in general elections. As of July 1, 2006, Michigan had an estimated population of 10,095,643, a decrease of 25,217, or -0.05 percent, from the prior year, but an increase of 157,199, or 1.6 percent, since the 2000 census. 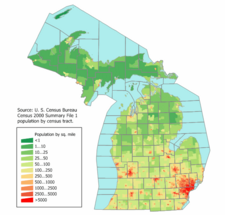 That year's census recorded Michigan as having the 8th largest population in the US. As of 2006, the state had a foreign-born population of 688,413. The five most frequently reported ancestries in Michigan are: German (20.4 percent), African-American (14.2 percent), Irish (10.8 percent), English (9.9 percent), and Polish (8.6 percent). Americans of German ancestry are present throughout most of Michigan. People of Nordic (especially Finnish), British (notably Cornish), and French ancestry have a notable presence in the Upper Peninsula. Many residents of western Michigan, especially in the Grand Rapids-Holland area, are of Dutch heritage (the highest concentration of any state). Metro Detroit has many residents of Polish and Irish descent, and is home to the largest Arab and Assyrian community in the United States. African-Americans form a majority of the population of Detroit and of several other cities, including Flint, Southfield, and Benton Harbor. Michigan is simultaneously known for its cities, supported by heavy industry, and its pristine wilderness, home to more than 11,000 lakes. The clang and clamor of Metro Detroit's crowded thoroughfares and busy factories stand in vivid counterpoint to the tranquility found in virtually every corner of the state. Its forestland covers nearly 52 percent of the state. Michigan has around 150 lighthouses, the most of any U.S. state. The first lighthouses in Michigan were built between 1818 and 1822. They were built to project light at night and to serve as a landmark during the day to safely guide the passenger ships and freighters traveling the Great Lakes. College sports are very popular in Michigan. Classic in-state rivalries between the University of Michigan, Michigan State University, and Eastern Michigan University attract large and loyal followings particularly in football. ↑ 1.0 1.1 Michigan in Brief: Information About the State of Michigan (PDF). Michigan.gov. Retrieved February 8, 2012. ↑ Michigan Dept. of Human Services. . Retrieved April 30, 2008. ↑ Christopher J. Bessert, January 2, 2007. Michigan Highways Historical Overview Michigan Highways.org. Retrieved November 24, 2007. ↑ Jeff Karoub, June 1, 2007. Detroit Expects Half of Iraqi Refugees ABC News. Retrieved November 24, 2007. Bald, F. Clever. 1961. Michigan in four centuries. New York: Harper. Michigan State University, and Wayne State University. 1955. Michigan statistical abstract. East Lansing: Bureau of Business Research, College of Business and Public Service, Michigan State University of Agriculture and Applied Science. Michigan. 1960. Michigan manual. [Lansing]: State of Michigan. Clarke Historical Library, and Historical Society of Michigan (1874- ). 1986. The Michigan historical review. Mount Pleasant, Mich: Published by the Clarke Historical Library at Central Michigan University in cooperation with the Historical Society of Michigan. Groop, Richard E. 1984. Michigan political atlas. East Lansing, Mich: Center for Cartographic Research and Spatial Analysis, Dept. of Geography, College of Social Science, Michigan State University. Public Sector Consultants, Inc. 1986. Michigan in brief an issues handbook for the 1986 elections. [Lansing, MI] (300 S. Washington Sq., Suite 401, Lansing 48933): Public Sector Consultants. Weeks, George, Robert D. Kirk, Paula L. Blanchard, and Don Weeks. 1987. Stewards of the state the governors of Michigan. [Detroit, Mich.]: Detroit News. ISBN 0961434422 * Population and Population Centers by State in 2000. State Centers Census. Retrieved November 21, 2007. Expansion Projects Census. Globe Investor. Retrieved November 21, 2007. Official State of Michigan Portal.Michigan's State Symbols. Library of Michigan. Michigan in Brief. United States Geological Survey. Michigan. This page was last modified on 3 October 2018, at 16:42.